Elegant Couples Retreat to Enjoy Quiet Moments, Breathtaking Views, Each Other! $125 cancellation fee for Noncompliance of Required Documentation. Please refer to our Booking Requirements on first page of our Contract. * SECLUDED INTIMATE LUXURIOUS HONEYMOON CABIN OR ROMANTIC COUPLES GETAWAY! * AUTHENTIC RUSTIC HAND HEWN LOGS AND ELEGANT DECOR! * SPECTACULAR VIEW OF LAYERS OF THE GREAT SMOKY MOUNTAINS! * BREATHTAKING SUNRISES WHILE SOAKING IN THE PRIVATE HOT TUB! SWIMSUIT/TRUNKS OPTIONAL! * NEAR THE PARKWAY AND DOLLYWOOD, BUT FAR ENOUGH OUT TO BE PEACEFUL, SECLUDED AND SURROUNDED BY NATURE! * NOTHING BUT WOODLAND ACROSS THE ROAD, NOT IN A RESORT SETTING, NO VISIBLE CABINS DOWN BELOW! Come my love, move soft with me, where the wild birds cry and the mountains reach out to kiss the sky. Stairway to heaven is an authentic rustic luxury honeymoon cabin designed for romance and comfort. The furnishings are a very elegant and an upscale design, decorated with classic touches of art and décor from the neoclassical and romanticism periods in history. There are two levels in this cabin. The master bedroom and half bath with new flooring and commode are located in the loft. You will wake up every morning to some of the most incredible views of the Great Smoky Mountains you will find. One look and you will know how we came up with the name Stairway to Heaven. The intricately carved king sleigh bed has a luxurious designer comforter and new memory foam pillow top mattress. The majestic crown and crystal chandelier are the final touch in creating a sensual and passionate atmosphere. There is a 32 inch High Definition LED Television and Blu Ray DVD player for your viewing pleasure in the loft as well. Whether you are sweethearts, just starting out, getting ready to tie the knot or in a seasoned marriage, Stairway to Heaven will bring a sensual awakening to your relationship. The flow of this cabin brings on feelings of serenity and peacefulness, quiet times to be shared with someone close to your heart. Downstairs is newly remodeled with new flooring throughout. The bathroom also has new flooring and a new commode as well. All the small appliances in the kitchen are brand new including the over the stove microwave. The kitchen is completely stocked with all new dishes, glassware, utensils, pots and pans. Everything you need to create an intimate romantic dinner for two while watching the sunset light up the mountains. The dining area is situated to enjoy the mountains and fireplace while enjoying good food and each other. The living area has a reclining loveseat for two with drink holders, a cozy gas fireplace available October 1st to April 1st and of course that 50' plasma television. The tv console has a blu ray player and board games, for some intimate game playing and a little competition to spice things up. There is a jacuzzi tub, big enough for two, just outside the bathroom to daydream your cares away. The deck has a porch swing and two adirondak chairs to enjoy that morning cup of coffee while watching the sunrise color morning the sky or the smoke moving on the mountains. There is a hot tub to enjoy the layers of mountains or relax under a sky full of stars and experience the magic this cabin has to offer. There is a table for two on the deck to dine al fresco or to relax with a cocktail while grilling on the charcoal grill. This cabin is rented by the owners. When you call or email, that is who you will be speaking with. We are opening our home to you and we take pride in providing a completely furnished and clean cabin for our guests. Stairway to Heaven is an elegant and magical cabin that is perfect for your honeymoon, anniversary or special vacation getaway. We know that you will feel the tranquility and love that surrounds you in this place. We are Allen and Angelina from Marietta, Georgia. We love coming to the mountains to rekindle our spirits as often as we can. We have been together for over 35 years and our relationship is a testament to true love. We especially love the winters when the crowds have thinned all is peaceful on the mountain. We enjoy sitting in the hot tub for some together time and watching the smoke move on the mountains or the snow fall under a star filled sky. Allen's family originated in the Tennessee mountains so there is a re-connect for us here. We chose this cabin for the feeling of seclusion and the views of layers of mountains that go on forever. We wanted to offer other couples the chance to experience the magic and passion we feel in this place. Allen wanted the name Stairway to Heaven after standing in the loft and looking out the windows. So that sparked the idea of neoclassical and romanticism decor. We wanted to put together something elegant and sensual to share with couples to create new and lasting memories. This cabin is elegant and rustic, tranquil yet passionate. A truly special place to rekindle your relationship and enjoy one of the most beautiful views of the Smoky Mountains. toilet, combination tub/shower, New commode and flooring. Hair dryer in vanity. toilet, Half bath located in the loft with new commode and flooring. Free Wifi! High speed wireless internet. You may want to bring a beach towel for the hot tub. New Leather Power Reclining Loveseat with Console! Brand new Dishwasher, July 2016! Brand new located over the stove. Drip style coffee pot. The first two pots on us! Filters are also supplied for the coffee pot! A Keurig is available as well! Bring your k-cups! We try to maintain a stock of spices for our guests. Please leave them for future guests. Fully stocked with everything you will need to create a wonderful romantic dinner for two. The mountain view and fireplace create a romantic atmosphere to enjoy with your dinner. There is also a dining table on the deck to enjoy your morning coffee or dine al fresco with an amazing view! Brand new high definition 50' plasma television. Over 300 channels including HBO, Showtime, Cinemax, Starz and Sirius XM Satellite Radio. Brand new blu ray dvd player. There are board gaimes available for quiet nights together with a little competition. We keep a small stock of DVDs available for a night of movie watching. 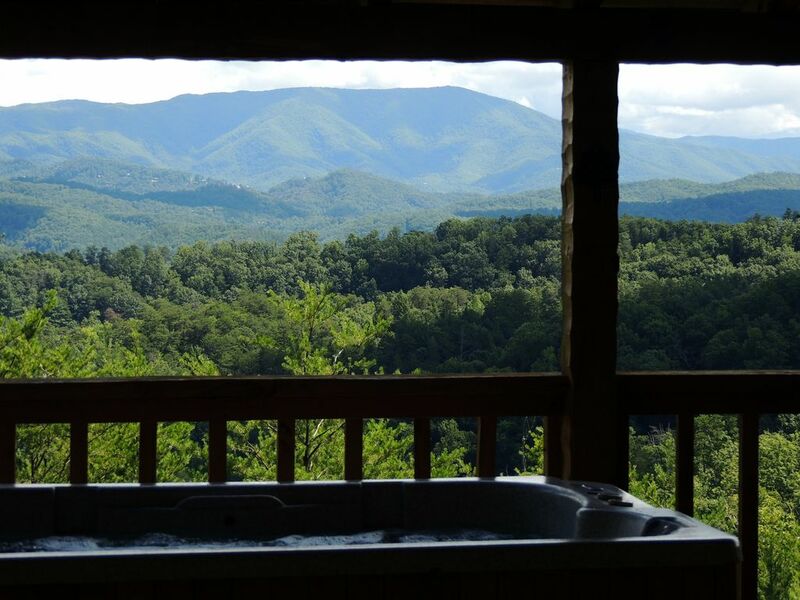 The deck has a hot tub with amazing views of layers of the Smoky mountains. There is also a porch swing to dream the afternoon away and a high top table and chairs for dining al fresco! Enjoy your time together surrounded by the beautiful mountains or a star filled night sky. Thank you so much. We had a wonderful five night stay. Everything about the cabin was first class. Everybody was so nice and happy to see visitors. You have to eat at the Local Goat great burgers and the Italian restaurant was top notch. This was our first trip to the Smoky Mountains but will not be the last. We will be back. Thank you again for the great hospitality. Perfect location for the celebration of my husband’s 60th birthday. Angelina and Allen were gracious hosts and extremely helpful and kind. We will definitely be back! I booked this cabin as a surprise for my husband's birthday weekend to give ourselves a break from work and all of life's busyness. Our getaway couldn't have come at a better time or been spent at a better place. Angelina was a pleasure to work with. Getting in touch with her was always easy. She was very knowledgeable about the area from bear safety and hiking to night-out and restaurant recommendations. The cabin itself was quaint, and the decor made for a romantic and cozy atmosphere. It was extremely clean and well-organized. There was enough space for the two of us and nothing was lacking in accommodations. The views were stunning! You can see the beautiful mountains from both floors of the cabin. The evening view was especially nice from the hot tub. Waking up in bed to the view of a gorgeous mountain sunrise beat waking up to an alarm clock any day. The location was perfect. We were secluded enough to feel like we had the mountain to ourselves, but we were a short 15-30 minute ride from Pigeon Forge, Gatlinburg, and the Smoky Mountain hiking trails. It rained one of the days we were here and there was still plenty to see and do. We had enough close-by for ample entertainment, but also enjoyed doing nothing at the cabin. Whenever we went out, we looked forward to coming "home". This experience exceeded my expectations, and more importantly my husband had a memorable birthday adventure. We look forward to coming back again one day. A Fsntastic Getaway for A Couple! A clean, secluded, restorative retreat with INCREDIBLE views. My husband and I loved this home and our time here. Don’t scroll past this listing without strongly considering.! You will not be disappointed. Absolutely beautiful!! A+ all the way. Gorgeous view!! A+ stay. We will definitely be back again. Beautiful cabin and very clean. Angelina was very knowledgeable of the area and went above and beyond to make our stay enjoyable. The cabin was beautiful, clean, and comfortable! The views we’re breathtaking and I would be back in a heartbeat! Angelina was so nice and helpful before, during, and after my stay! It was a safe area and very easy to get around (which there is a ton to do)! The pictures online do not do it justice it’s way prettier! The only downfall of my trip was when I had to leave. Just a great few days to relax and enjoy the mountains! Lauren... Thank you for this Awesome review. We will pass the compliment on to our cleaners. They are always so appreciative, they take pride in their work and are always grateful for the kind words. We enjoyed hosting you and hope this was one of your best spring breaks yet! You really got a lot of fun in the days you spent with us. Laurel Fall, Alum Bluff Cave, Ole Red, The Island, Ziplining and some Beautiful Sunrises! We know that hot tub must have felt like heaven after those hikes. You are right! It is so much better in person than in the pictures. You will just have to come back for another visit and a new list of things to do! You are always welcome and we look forward to your next visit! Good luck in School! We know you will be awesome! *** SEE OUR OTHER CABIN: 608075 (Knight of My Dreams) vrbo.com/608075 (Copy and Paste in Browser) ***WILL RENT 1 or 2 NIGHTS DURING 3 NIGHT MINIMUMS IF LEFT BETWEEN BOOKINGS. CONTACT OWNER TO RESERVE! *** RENTAL RATES AND MINIMUM STAYS ARE SUBJECT TO CHANGE UNTIL RESERVATION IS CONFIRMED!